A frenchman with no commentary on the Physiocrats? 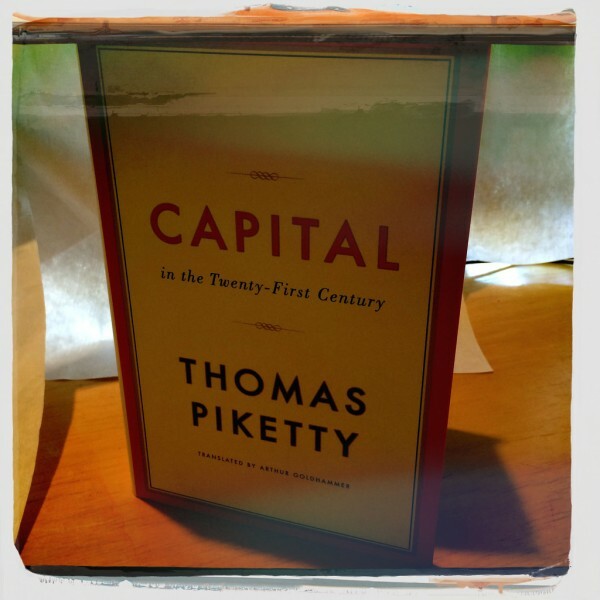 Mason Gaffney, author of the groundbreaking The Corruption of Economics and the recent Gaffney Reader, analyses Tomas Piketty’s bestseller ‘Capital’. Through some magic or mystique, Thomas Piketty, in his Capital in the 21st Century, has done us the service of thrusting distribution back into the limelight. Oxfam, which he cites, has been urging this for some time. “Heterodox” and “radical” economists may discuss it widely, but little is said about it by the popular Nobelists and journalists who are the face of the profession. Piketty’s basic thesis is that capital “accumulation” inexorably overtakes GDP and/or income, so the capital/income (K/Y) ratio keeps rising, leading inequality to increase to unsustainable levels. Piketty bolsters his model with Himalayan ranges of data from 20 nations over long time periods. Thus he speaks to both historians and abstract modellers. That by itself is a positive and needed integration — but on the minus side, it takes patience to show that the data are flawed and/or do not fit the model. The first reaction of an importunate reader or a journalist making a deadline is to bypass the “mere semantics” as nitpicking. He claims his data, mostly from national government sources, go back 300 years, but the U.S. is only 225 years old, and early data-keeping was sketchy and not very reliable. Germany, Italy and Greece did not exist before ca. 1850. Even Piketty’s France, ancient in song and story, is on its 5th Republic since The Revolution. Meanwhile, Piketty omits many good and germane data sources, e.g. the reports of several U.S. Government agencies like the Bureau of Corporations during the Progressive Era, the U.S. Census of Governments under Allen Manvel’s leadership, John McEwan’s recent work on Who Owns Scotland?, the TNEC reports on concentrated control of U.S. industries, the Truman Committee Reports on monopoly in war industries, Professor Robert Montgomery’s The Brimstone Game on the U.S. sulfur cartel, Hoyt’s 100 Years of Land Values in Chicago, 1833-1933, etc. Piketty claims to have a “new theoretical framework that affords a deeper understanding of the underlying mechanisms.” This “new” framework depends on invoking the old spectre of exponential growth over long time spans, proven by assumption. Using exponential growth as a spectre goes back at least to Sir Archibald Napier, who was a great mathematician, but also a major Scottish landowner and militant protestant who stood to gain in the time of Henry VIII and the enclosures. Later Malthus used it to promote the bugaboo of overpopulation. This “exponential determinism” is not identical with technological determinism, but has a lot in common as a rhetorical device, in that it lets one ignore public policy, especially tax policy, as a determinant of factor ratios. Piketty assumes that capital substitutes for labor: more K, instead of making jobs, destroys them. A series of Luddites, most of them more sophisticated than the original Ned Ludd, have stirred up their readers by assuming capital is primarily or always labor-saving. Karel Capek’s play RUR dramatized the nightmare. Eli Whitney’s cotton gin, Cyrus McCormick’s reapers, John Deere’s plowshares, Henry Ford’s tractors, were all supposed to destroy small farms, but it was not until 1935 that the mean size of American farms began to creep above 160 acres. Viewing tractors superficially they seem to substitute for labor, but what they mainly displaced were draft horses. Before tractors, feed and pasture for draft animals used about 1/3 of all land in farms, so tractors saved more land than labor. Piketty defines capital to include all forms of private property, including land. Returns to capital thus include profits, dividends, interest, rents — everything but wages, it seems. This opens the door to all kinds of double-counting, both in numerator and denominator, leaving us with a ratio whose meaning is complex and unknowable. As to public capital, Piketty says little, presumably because it is not valued in any private market, as required by his definition. Thus infrastructure, and social overhead capital, are missing from his work. Piketty conflates land with capital (K). Therefore, since capital grows exponentially, land must, too — so there will be no problem of overcrowding land, no diminishing returns to K, no disproportion of factors. Furthermore, his claim of showing “The dynamics of private capital accumulation” is inherently confusing. Does he mean social capital formation — or agglomeration by individuals of both land and capital, e.g. the 1% vs. the 99%? Having no separate category for land, Piketty cannot deal with settlement sprawl, migration, conservation, depletion, exhaustion, and other matters of scarcity of the finite Earth relative to capital and labor. It’s nearly forgotten now, but only a few years ago there was a great fad for Julian Simon’s The Ultimate Resource (1991), meaning us, humans. We are so creative we can create more of everything, including natural resources. By conflating land with capital, Piketty in effect seems to side with Simon on this, although I cannot imagine how he reconciles Simon’s optimism (or complacency?) with his own pessimism. Like Henry George, Piketty sees a solution to Marxian doom, and the two proposals even bear a superficial likeness. George, as is well known, proposed abating all taxes but one, a tax at a high rate based on the value of land — all forms of land. Piketty proposes a similar tax on the base of all forms of private wealth. Piketty’s new proposal will not withstand the predictable attacks for at least three reasons: 1) It includes all forms of wealth, mobile as well as immobile; 2) It is to be worldwide, to avoid evasion manoeuvres. But there is no worldwide government, nor will there be in the foreseeable future; 3) It cannot impose a very high rate, because mobile capital will either never be formed, or be consumed and dissipated, or find ways to emigrate. Henry George’s old proposal is free of those problems. It is only on land, which cannot move between nations, or over towns and counties and school districts. It is to be national or even subnational. The needed governments and collection institutions already exist. It can be levied at very high rates, because land cannot move out of a taxing jurisdiction, which is defined as an area of land. Finally, untaxing capital and labor enhance the value of the land-tax base within the jurisdiction that untaxes them.